Andrea from Mailbird here 🙂 This is a longer post, but you won’t want to miss anything here. Read all the way to the end! Yes, it’s been a while…only because we’ve been making sure to address and improve Mailbird by listening to and evaluating each suggestion, iterating suggestions, testing them, then getting your feedback again. Did you know that 76% of email users, just like you, primarily access email from a laptop or desktop computer? Why is that? It is because that is when you really want to sit down and get productive and why a solid desktop email app is a must-have when it comes to managing all that information, follow up, calendar events, and more. We’re making some really cool things happen with email so you can continue to be a Mailbird email champ by enjoying email, managing information overload better, and getting the most out of your day without spending all of it in your inbox. It’s true, we are helping you live longer by reducing daily stress. Have you noticed? Since our last blog post on May 16, 2013 we’ve made 54+ modifications with a solid mix of bug fixes, optimizations, and improvements in less than 3 weeks. 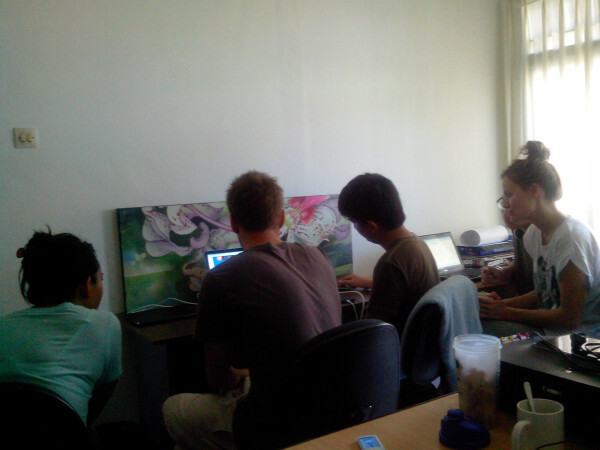 Mailbird Coding Ninjas are hard at work and know what’s up when it comes to improving information processing and communication via Email. Check out all updates directly from Mailbird by clicking on the top left Mailbird drop down menu > Options > Updates Tab > View Version History. We couldn’t be happier to see the full engagement of Mailbird beta participants continue to grow and we will continue to get better, while making sure to take some serious time to listen to and evaluate your feedback. There is nothing better than getting a note of gratification from you after either having fixed a bug you experienced or updating the design or integrating a feature that works with your email usage and gives you ultimate inbox efficiency. One of the more popular requests we hear, alongside Multi-Account support, from you guys was the implementation of Spell Check. Now you have the option in the Mailbird and we are testing out an even better version of Spell Check in our closed Alpha testing. Remember to try Multi-Identities while waiting patiently for full Multi-Account support. Eddy walks you through the steps and benefits of the glorious Multi-Identities feature on the Tips & Tricks section of our website. Did you know that Mailbird gives you back two full work weeks per year? On average people spend about 111 working days dealing with email, and if email efficiency can be improved by a mere 10%…then maybe you can convince your boss to give you those two extra weeks of vacation this year. 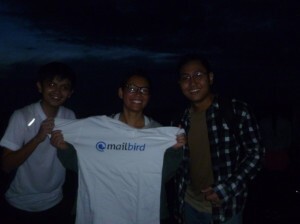 Maybe go surfing, sunset watching, hiking active volcanoes, and taking long walks on the beach with the Mailbird team in Bali. All you have to do is get on board with the most badass email client. Not only does the Mailbird team fly, we like to surf too! 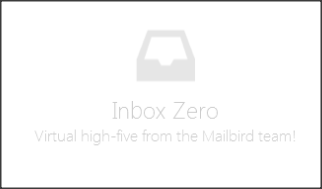 So let’s get you closer to reduced stress and that extra vacation today by using Mailbird and reaching Inbox Zero faster. 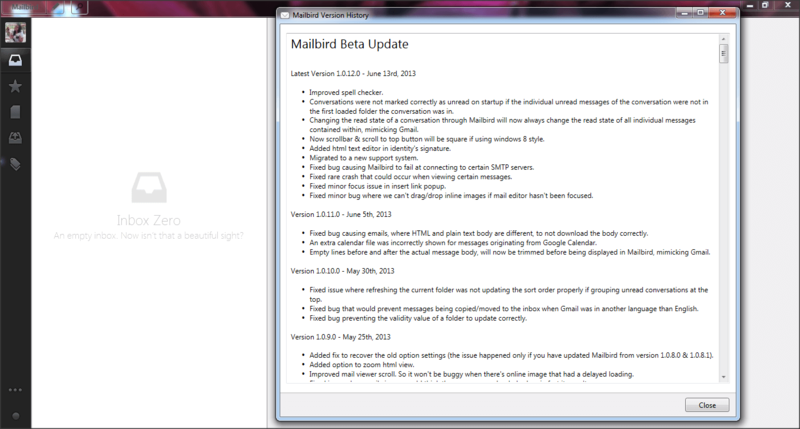 If you haven’t already, give Mailbird a try now and download the beta. Use Mailbird for Free or pre-order a better plan that fits your needs with more premium email features or a one-time payment lifetime plan giving you all the goodies of Mailbird Pro. An even better alternative for those of you who are not limited to the 9-5 Monday through Friday work week, you don’t have to be constricted to using an email client that is pre-loaded, pre-packaged on your work PC. 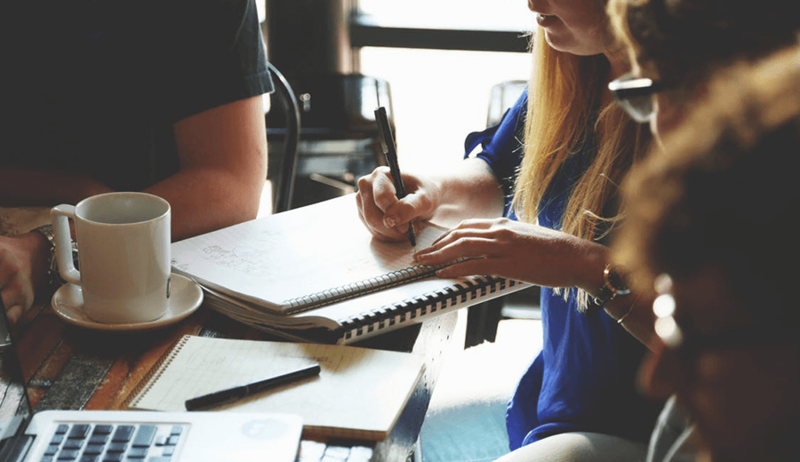 For many small businesses, small teams, and startup companies alike, we have something that we’ve heard requested time and time again. Finally it is here! The Mailbird Business plan for teams of 5 or more innovative and creative individuals, it is the Windows desktop email app for the modern work world. You get the best value, effectiveness, and proficiency with the Mailbird Business Plan, giving you the freedom and time to do more, change the world, and enjoy life. Got a team of 5 or more? Invite them to the Mailbird beta to test drive it for free and be the first to pre-order Mailbird Business.  We are thrilled to be a part of the evolving movement of the modern work world, improving how communication, information exchange, file sharing, productivity, and contact management interacts with each other right from the sweet Mailbird nest. New pre-order options now live on the website for the greatest desktop email app for Windows. “You did a great job making this awesome client, which is for now my personal #1 on Windows. Thank you!” – Yulia B. 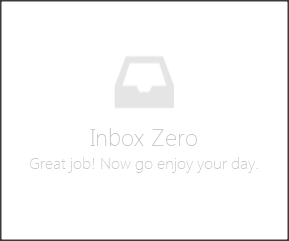 We hope that made you smile a little, along with the fun new Inbox Zero messages. Haven’t seen them yet? 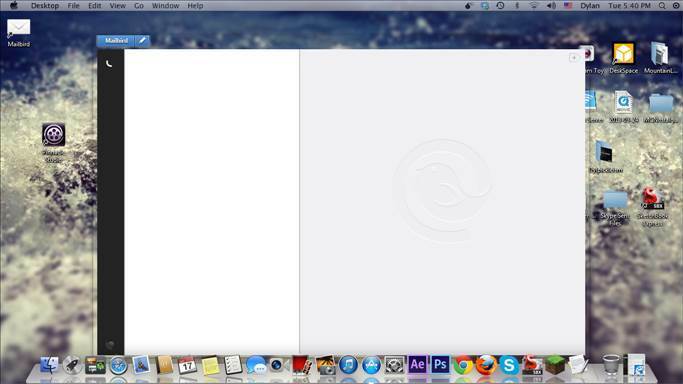 Goal for this week…hit Inbox Zero at least 2 times this week. Many of you have already shared your awesome Inbox Zero screen shots with us and we couldn’t be more psyched to hear how happy you are with your email now that you’re using Mailbird. 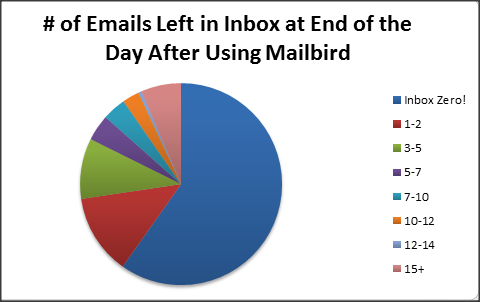 We are able to report these results thanks to the 1,200 users who responded to the latest Mailbird Usage survey (Results gathered within 1 month of the Mailbird beta launch on April 2, 2013). Straight from the Mailbird team, Daniel…we love you! Thanks for the help. Building an email company, reaching out to people who Mailbird was built for can be rather tough. For our current beta testers, we know how much you guys love Mailbird and with your help, we give a 100% guarantee that you’ll love it even more! A little support goes a long way like project donations, event participation, additional language translations, partnerships, app development to integrate within the Mailbird app platform and more, we welcome participants and open our doors to you with awesome high fives and gratitude for the sake of community, collaboration, productivity, and communication. 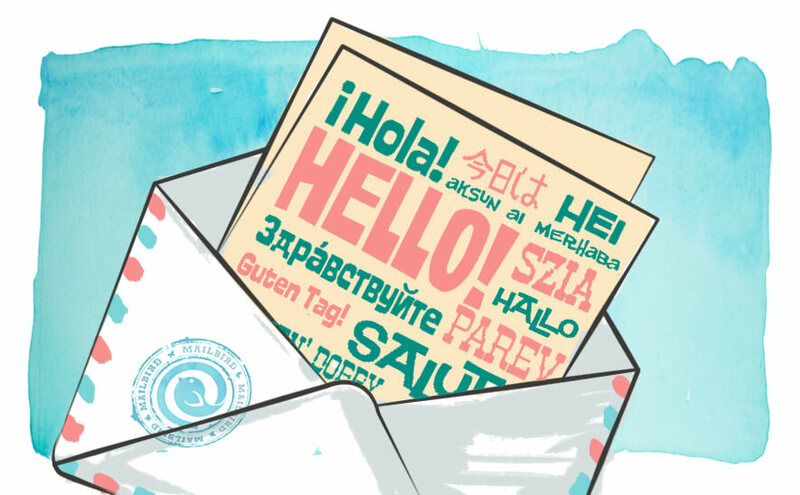 One more thing…if you want to continue getting all the Mailbird goodies and updates make sure to sign up for our Newsletter at the bottom of our home page. If you get an email and no longer want the hot news in the Mailbird nest simply unsubscribe and you’ll never hear from us again but we hope you still continue to use Mailbird. Be sure to refer friends to Mailbird now and we’ll have some special offers for you with a super Mailbird Frequent Flyer program (coming soon!). For those of you who love hearing what’s happening with Mailbird but haven’t received any email updates, check your spam folder or junk mail and make sure to add us to your contact list/white list. Do it now so you don’t miss a thing, it’s easy. We are testing out different support systems to make sure we provide the best support response to each and every one of you. Peace out until next time. 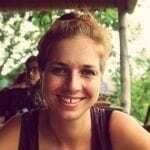 You’re friend and improved-email-info-overload concierge Andrea, CEO/Co-founder, communication lover, email management guru! 15 thoughts on "Ninja Kick Email Into Place"
Mailbird gives you 2 full work weeks back per year (and more as we continue to optimize your efficiency and productivity in email)…look at what you could do if you got back just 2 full hours in a year. 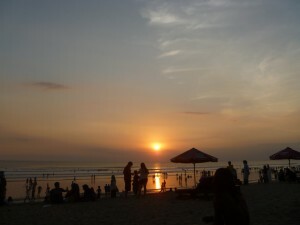 It was amazing and challenging. 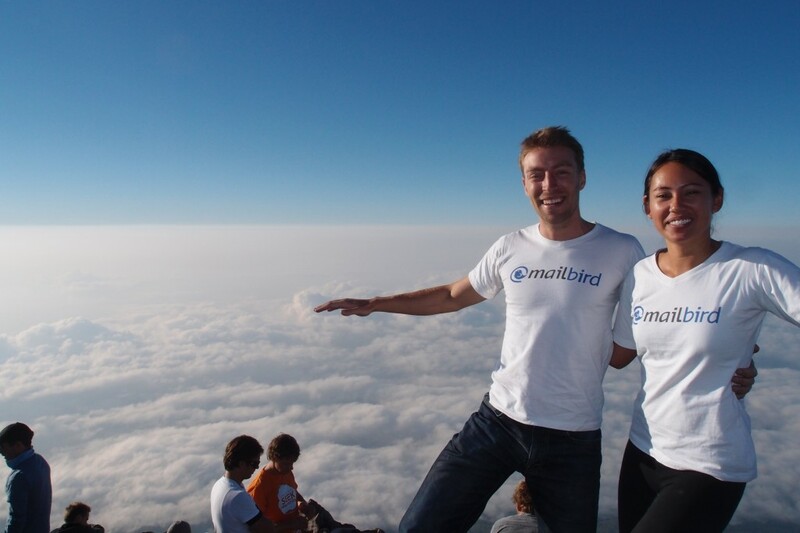 We actually shot a Mailbird video from the top of the mountain above the clouds. Was surreal. Let me know if you were not aware of any of these or if you need when trying these cool functionalities out 😀 After you’ve tried them and love them tell your friends to try it out too. 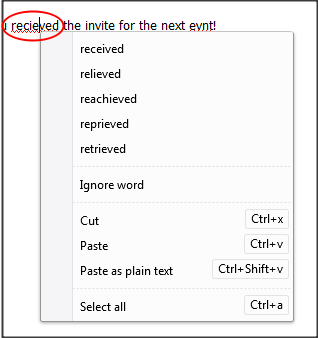 Hey, I was wondering — I see a little: “Sent from Mailbird” notice on all of my emails. Can I disable that? Yes you can during the beta 🙂 The option to remove branding from the advanced tab in the options menu. Is it possible for a third party to write apps yet? There are a couple of sites I’d like to access inside mailbird and would love to add these myself if it is possible. Hey Tim, it’s not yet open to the public, but we may be able to make an exception for you. Shoot me an email at ea(at)getmailbird.com with which apps you wanna create, and I’ll get you in touch with the dev team so you can make it so. Hey, I am switching to Linux in a large part on my systems, but for those that remain using Windows — this is a great email client! Really, I continue to be delighted by the features and workings of it. Thank you for committing to simplicity and ease of use without limiting the user’s ability! My boss wants me to purchase a Windows email client for our employees (we’re a fairly big company). I’m loving Mailbird’s interface, and its speed beats out all the other options I’ve looked out so far. However, I need to give my boss my final pick by next Friday, so that he can send out the purchase order in time. The only issue is, we really need the multi-account feature since we have multiple email accounts for multiple systems (ex. sales CRM, internal communication…etc), and there’s no way I can convince all of the employees to set up the multi-identities feature. Can you give me a “yes or no” for whether or not the multi-account feature will be available within a month? (That’s when the PO will be sent out). Which means the beta release of the first version of Multi-Account is very near. 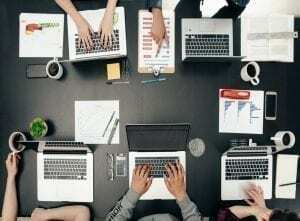 We would love to be the email and productivity solution for your employees. Multi-account will absolutely be there! Thanks for reaching out. Feel free to email me directly at [email protected] too for any updates or if you have any questions. I’d love to learn more about why you’ve chosen Mailbird and more about the company so I can give you all the info needed about Mailbird to ensure we meet your business and employee needs. Looking forward to your email Will! The one BIG reason why using one gmail account and multiple identities doesn’t work well is that Gmail’s feature of checking external POP accounts doesn’t check them very frequently unless you get tons of mail all the time. It checks based on the frequently with which you get mail, which of course conserves resources for Google but doesn’t help us receive mail from that external account with the immediacy for which email is intended. Hey Beatz, have you tried Mailbird? We get email almost as soon as Gmail does. I’m talking within seconds usually, and never longer than a couple minutes.